In front of the Vienna State Opera, one of the most prominent sites of the city, a sculpture is to be built by the Alban Berg Foundation for the composers of the Viennese School – Alban Berg, Arnold Schönberg, Anton Webern – and the composer and Court Opera principal Gustav Mahler. In the design solution towards the South and East, the existing quarry pit is revealed and the sculpted shell of the Snow and Ice World spans 170 meters from cliff to cliff over a sunken and hanging garden creating a new functional leisure space of islands, water, cliffside pathways and ramps connecting the building to this natural heritage. Like a modern acropolis the concept for the new National Stadium of Japan places the arena on a plinth as a sign in the center of the city. A large plaza is created by the plinth forming the main public entryway. The seating tribunes are conceived as landscape elements of the podium, and are covered by a light, shell-like roof touching the ground at only four points. The shell is topped by a retractable photo-voltaic glass roof element that separates into two visible wing-shaped leaves opening the stadium to the sky. 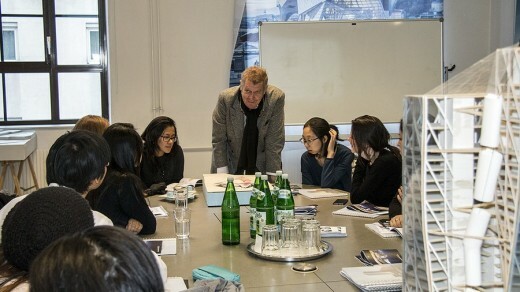 WOLF D. PRIX & PARTNER: 7+ PROJECTS, MODELS, PLANS, SKETCHES, STATEMENTS. 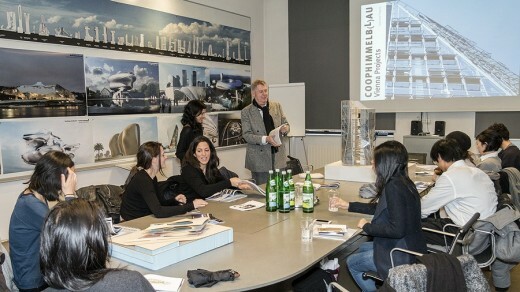 The Architecture Forum Aedes in Berlin dedicates Wolf D. Prix an exhibition on the occasion of his 70th birthday from December 13, 2012 to January 24, 2013. 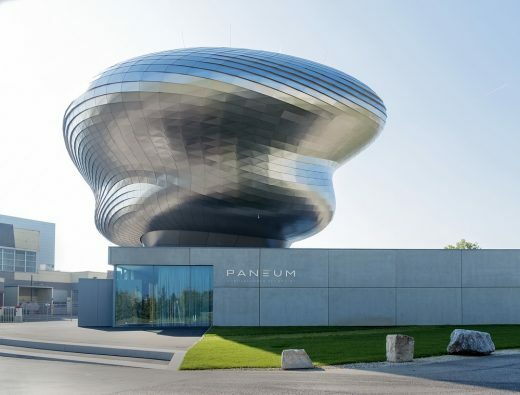 Vienna, August 9 2011 – This architecture studio received the Dedalo Minosse International Prize for commissioning a building for their design of the BMW Welt in Munich on June 24, 2011 in Vicenza, Italy. The Dedalo Minosse International Prize was handed over by Bruno Gabbiani, president of the Italian association ALA – Assoarchitetti during a festive awards ceremony. According to the organizers the Prize boosts “the quality of architecture looking at final result, analysing and focusing on project and constructive plan process and giving a special attention to people who determine the success of the work: the architect and the client, supported by the project executors (the building firms) and the public administrations”. The biennial Dedalo Minosse Prize was founded in 1997 and is currently in its eighth edition. It recognizes the Client’s figure as fundamental and strategic in the constructive process. Red Dot Design Award for the High School #9 – the prize was assigned during an awards ceremony on July 4, 2011 in Essen, Germany. The Central Los Angeles Area High School #9 for the Visual and Performing Arts has been awarded the “red dot” seal of quality for high design quality by the jury with its panel of highly respected experts. The design will then be put on public display in the exhibition “Design on stage – winners red dot award: product design 2011” in the red dot design museum at the world heritage site of the Zeche Zollverein Coal Mine Industrial Complex in Essen. The red dot design award dates back to 1955 and is now said to be the world’s largest and most distinguished design competition. It breaks down into the three disciplines ‘red dot award: product design’, ‘red dot award: communication design’ and ‘red dot award: design concept’. October 20, 2017 in Architects.